There was a fleeting but nonetheless noticeable silence a few minutes into this latest edition of What Would Julie Do?, a series of live performances celebrating the life and career of Dame Julie Andrews. The irony was not lost (at least, I don’t think so) on the audience on the announcement that a guest performer had to pull out of this musical theatre cabaret because in the precise words used, “she has no voice”. How does one react to that, given what happened to Dame Julie in the late Nineties, when surgery on her vocal cords resulted in the loss of her singing voice? As the old adage would have it, the show must go on. This show took ‘Soldiers in Petticoats’ as its theme. The short explanation is that it’s taken from a lyric in ‘Sister Suffragette’, a number in the motion picture Mary Poppins (omitted from the stage musical version): “We’re clearly soldiers in petticoats / And dauntless crusaders for women’s votes / Though we adore men individually / We agree that as a group they’re rather stupid!”. 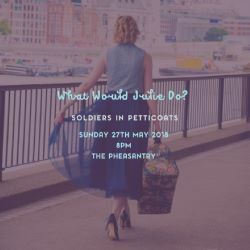 The slightly longer explanation, at the risk of giving too much away, is that ‘soldiers’ and ‘petticoats’ are traditionally associated with the male and female gender respectively, but we’re now seeing women on the frontline, and men are being encouraged to ‘open up’ a little more – that is, to display figurative petticoats. That is, in turn, emotions other than anger. A self-confessed “feminist rant” from host Rosie Williamson did seem to suggest proverbially fighting fire with fire. It was balanced out, however, by highlighting the sheer number of male suicides in Britain on a daily basis because, in part, of a tendency to not seek help with regards to mental health issues (just as there is a reluctance to seek medical attention with regards to physical health ailments). Elsewhere, Williamson rattled through carefully pre-prepared remarks at quite a pace, keen not to waste time – and why not? It may not have been the sort of cabaret show where the host interrupts themselves and starts awkward conversations with people in the front row, but there’s nothing wrong with being slick and polished. You know, like Dame Julie. Williamson was joined by Elise Allanson, Lucy Clough, Rebecca Ridout and Joanna Thorne – and if the first half had variety with a capital V, the second was an opportunity for power songs and mellow melodies to reign supreme, bookended by a bolshy Beyoncé number, ‘Run The World (Girls)’, reprised at the curtain call. Some light amusement was found in ‘Times Like This’ from the musical Lucky Stiff, in which dogs are praised for being the perfect companion for a lady. ‘Like Love’, from the musical comedy Charlie Girl, not seen in the West End since 1986, tells an intriguing narrative about a young lady who would rather have even a small percentage of the man she loves than one hundred percent of anyone else. What Would Julie Do? Live returns to The Pheasantry for another evening of musical theatre therapy. Singer, Actress and Blogger, Rosie Williamson has long been compared to Mary Poppins, but outward appearances can be deceiving: She is, like most of us, far from practically perfect in every way. Rosie often takes hypothetical advice from the guru of musical theatre perfection, the superstar, the legend that is…Dame Julie Andrews. Whenever she is in a stew, she asks: “What Would Julie Do?”.